Campus constituents today are increasingly dependent on mobile devices, which is why Engage2Serve delivers a proven set of higher education solutions for recruitment, retention and alumni management that help institutions make enormous strides in student engagement and operational excellence. Our team has a deep understanding and experience with integration of our mobile and CRM systems to other campus systems including with leading SIS and LMS products. The e2s SaaS suite is quick to set-up and easy to manage while requiring no additional IT equipment to be purchased or reallocated. Hosted on AWS, for reliable consistency, e2s supports high-volume activity, and event capture, tracking, and execution. It is also highly configurable to match needs including custom fields, permission settings and desired tools/features. Keeping your data safe is our highest priority. We provide world-class security based on proven industry best practises, test all code for security issues before release, regularly scan our network and systems for vulnerabilities. 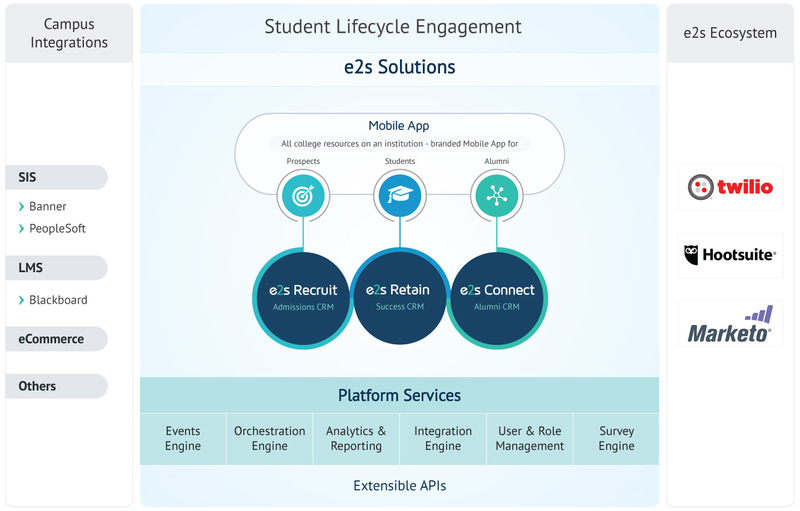 College staff can get on a SaaS platform to use the powerful e2s portal, while students download their mobile apps from app stores to get connected. Bravo! All campus constituents are now part of one happy family! Serve and engage your students like never before. Get an instant snapshot of students' mobile app usage through dashboards of analytics that captures trends around student issues and queries, community participation, content demand, event attendance, poll responses and search behaviour. Trends that tell you what students are looking for! 21st century students are on the move and extremely device friendly! A smart, informative and engaging mobile app is the easiest way for outreach and engagement. Connect with your students, and let them connect with one another for learning and leisure! Built on a cloud foundation that you can trust. Performance you can count on, every day. Constructed on a modern SaaS architecture on AWS, our cloud-based Student Lifecycle Engagement Platform supports high-volume activity, and event capture, tracking, and execution. Easily scale as needed with our platform that's built to handle hundreds of millions of activities per day. Our platform can be customised across many dimensions, including custom fields, custom objects for many-to-many relationships, and custom activities across different channels and devices, supporting large-scale IoT, for next-generation applications in our hyper-connected world. Keeping your data safe is our highest priority. We provide world-class security based on proven industry best practices, test all code for security vulnerabilities before release, regularly scan our network and systems for vulnerabilities. The e2s API uses industry-standard web tokens based access control, this provides secure access to e2s data while preventing direct access to e2s databases. We support external identity providers (IdPs), including Active Directory, CAS, LDAP, OpenID, and SAML/Shibboleth. All data is securely stored in highly stable and geographically diverse Amazon Web Services (AWS) data centre locations. To ensure the privacy and security of your data, e2s uses HTTPS for all communication and encrypts all inbound and outbound traffic using 128-bit TLS/SSL. e2s is configured to support multi-zone availability which provides redundant data replication to a secondary server in a different location and ensures seamless failover. We retain daily database backups for up to 2 weeks and process hourly incremental backups that greatly reduce potential data loss. We automatically install necessary security patches to provide and maintain the highest level of security at all times. With e2s, capacity scales automatically with demand with automated peak load management. So when you need us most, we're up and ready to go. Native cloud means no versions, no upgrades, no downloads, and no migrations. It all happens automatically, so there's less risk, less to manage, and less downtime.